Ulyukayev’s appeal against ruling to return $2 mln to FSB general set for Sep.24 | Russian Legal Information Agency (RAPSI). 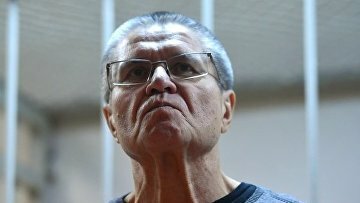 MOSCOW, September 6 (RAPSI) – The Moscow City Court will hear an appeal filed by Russia’s former Economy minister Alexey Ulyukayev against a lower court’s ruling to return $2 million that ex-official received as a bribe to the Federal Security Service (FSB) general Oleg Feoktistov, the court’s spokesperson has told RAPSI. The appeal hearing has been scheduled for September 24. Earlier, it was revealed that money was transferred to Ulyukayev during the investigatory experiment in 2016. In July, the court ruled to return money to Feoktistov, who personally filed an application for return of the assets. The former minister was sentenced to 8 years in high security prison and a 130-million-ruble fine (about $2 million) on December 15, 2017. Moscow’s Zamoskvoretsky District Court held that his involvement in the bribery was proven by witnesses’ testimony and other examined evidence. The defendant’s words about innocence were regarded as attempt to evade criminal liability. Later, the Moscow City Court upheld the prison term for Ulyukayev despite slightly changing the sentence itself. Ulyukayev was arrested on November 14, 2016, when leaving the office of Rosneft oil company. The Federal Security Service’s (FSB) officers found a bag holding $2 million in cash in his official car. He was charged with extortion a grand bribe. According to the Investigative Committee, he threatened to create obtrusions for Rosneft with the use of his position. Ulyukayev stated that the case was fabricated. The defendant noted that there was a provocation, orchestrated by FSB and that there was no sound evidence in the case, aside from testimony provided by Rosneft CEO Igor Sechin. President Vladimir Putin relieved Ulyukayev of his post because of loss of trust on November 15, 2016. On June 4, the defendant was transferred to a prison. 15:43 06/09/2018 The Moscow City Court will hear an appeal filed by Russia’s former Economy minister Alexey Ulyukayev against a lower court’s ruling to return $2 million that ex-official received as a bribe to the Federal Security Service (FSB) general Oleg Feoktistov.